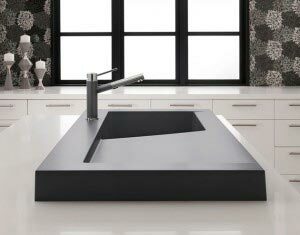 Posted November 11, 2013 by Norburn Lighting and Bath Centre & filed under Kitchen & Bath Plumbing, Kitchen Sinks . 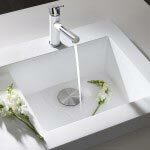 Installed as an above-counter fixture with a more vertical profile than most counter-mounted sinks, the Modex exudes both minimalism and design power. 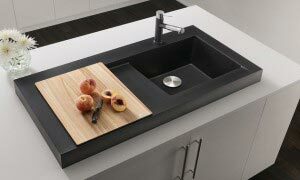 The Modex’s design is the product of a clever rethinking of the space around a traditional sink, which often becomes covered with water or food particles throughout the preparation of a meal. 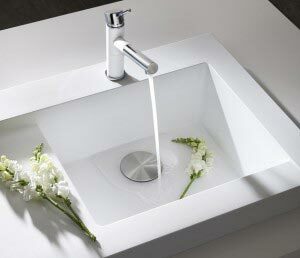 To the basin’s left, an angled tray funnels excess water down towards the drain without any mechanical interaction. Gravity alone does the work of ridding of waste water, and the side tray isn’t limited to that purpose alone, either. Down inside the basin, the cap of the actual drain assembly is wide and crafted of stainless steel, with an extremely small clearance to keep unwanted particles from entering. In a kitchen with light counters, the drain of a black Modex connects the sink structure to the fixtures around it. 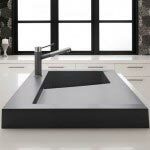 The sink comes in six colors, all of which are finished with protection against chipping or wear, with special attention paid to reaction with food ingredients that may slowly deteriorate other finishes. All of these are coated in a layer of bacteria-resistant materials as well, keeping the sink and its side assembly clean for food preparation. 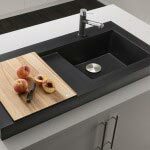 The sink comes with a fitted and leveled cutting board mounted above the angled platform, transforming that area into additional counter space with direct disposal of scraps as needed.